Migraine Monologues: Guest Blog Post! : How The Spring TMS Device Stops My Migraine Attacks. Guest Blog Post! : How The Spring TMS Device Stops My Migraine Attacks. 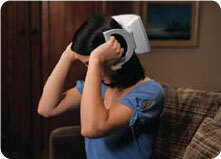 When I first read about a portable magnetic machine that could supposedly "cure" migraines, I was naturally sceptical. But as the research trials continued it appeared that this device, whatever it was, could be quite promising. I wanted to know more. So when I bumped into one Andy Bloor at the EHMTIC conference last weekend, and he mentioned he was using it, I asked if he'd write a guest blog post about his experience with this fabled machine. OK, I stalked the poor guy - my previous life as Head Hunter comes in handy when tracking people down.... Andy, I apologise but I'm sure you'll all agree it was worth it. Over to Andy. Q – what’s the size of the Oxford English Dictionary, weighs as much, comes in a neat carry case, but may possibly stop migraines in their tracks? A – the Trans-Cranial Magnetic Stimulation (TMS) device. I asked one of the class to get my colleague next door and she helped me down and I went, hugging the wall, down to the staffroom. A colleague and friend saw me in the staffroom and said "That’s a migraine." (Oh, if only I’d listened to you at the time Jo!) With this information I went to my GP… and came out with a diagnosis of Labyrinthitis (an inflammation of the inner ear). After all, why diagnose migraine: there was no headache. About 6 years later I had my first full blown ‘headache with vomiting’ attack: it was like the film 'The Matrix', when Neo comes out of the matrix and seems disorientated, vomits and then is fine. "He’s gonna blow; he’s gonna blow" they cry: and he does. I had a pounding headache, vomited and a few hours later felt better. This time my (now different) GP diagnosed migraines. Thus started the long journey that took me from GP to neurologist and finally to the Princess Margaret Migraine Clinic in Charing Cross Hospital, London. Then a whole range of drugs were tried. The most effective seems to be Lamotrigine along with co-codamol and Buclizine (you know… the little pink one!) as an acute medication. Of course, with co-codamol came the concern that I may start to get chronic pain migraines. This became particularly of concern when the migraines started to get more frequent. About a year ago I was asked to trial a device that it was hoped would stop my migraines. It was explained to me that it was an acute treatment so only had to be used when the migraine descended. My first reaction was, I’m sure, similar to many migraineurs: if it works I’ll try it. Eating hedgehogs; dancing naked at the full moon; I’ll try anything if it ameliorates or even stops this blight on my life. So I tried it. And it works. You need to get to it early enough and the initial dose isn’t always enough. But for me, it works. You charge it up (and it has to be at room temperature or the thing throws a hissy fit and you have to wait, so never leave it in the car overnight! ), then place it at the back of your head and ‘fire’, by pulling two sliders on the device. It emits a ‘clunk’ and in doing so administers an electro-magnic pulse into your brain. This pulse is designed to affect the parts of the brain that are sensitised by migraines. On my prescription, if after the first two doses things don’t get better, then you administer one more dose each 15 minutes until the migraine abates. Now before you all go rushing to your GP, there are a few things to consider. Firstly, it’s on clinical trial so probably won’t be widely available for a while. Secondly, it may not work for you. We all know that some interventions, pharmaceutical or otherwise work for some and not others. Each migraine is different for each person; so is the most effective treatment. Andy Bloor is an academic in an Univeristy in the South East of England. He has had migraine for around 17-19 years. He is currently studying for his PhD. Topamax Trials & Tribulations Part II: Is it working? It does all sound quite promising doesn't it! Very exciting. Thanks as ever Victoria for your super helpful website. I followed the link to the Migraine Trust website and saw that this was being trialled at my local hospital in Staffs, so I have written to my GP and been referred. So excited about this. Unfortunately eating hedgehogs didn't work for me...a bit prickly on the throat. The most common headaches include tension and migraine, which are associated with nervous system disorders. Most people know Chiropractic care can be beneficial for tension/cervicogenic headaches. But, can Chiropractic care help migraines too? I have had a tms for 2.5 months and chronic migraine for 7 years following a head injury. It works! Took 6 weeks taking max dose every day but oh boy it works! Now off triptans and naproxin. Still having botox every 12 weeks, preventative drugs do not work for me. With persistent treatment the migraine does not come storming in anymore. My only concern is the price of £160 a month that I will have to pay once my 3 month free trail is up. NHS do not fund this device at present. Hi there, please can you advise where you obtained your Spring TMS? Thanks. there that I'm completely overwhelmed .. Any ideas? Appreciate it! I'm living in Sweden and would like to have SPRING TSM device. Can somebody help me how I can afford it? Any online shopping is available?